At the little beach side hotel we were staying in – a real Italian family kind of place – the husband and wife chefs turned out homey and delicious variations of classic Italian cuisine. We went in to see them at work and were so taken with their honesty and sweetness that I wanted to give something back to them, so I invited them out for a portrait. I couldn’t ask for a more playful pair of lovebirds. He simply found her irresistible, she was his ‘dumpling,’ and he couldn’t keep from snuggling and hugging her, even dancing around together for a moment. I suddenly felt that their restaurant (sadly they didn’t come back the next year, business being really tough in Italy’s economy, and we really missed them on our next visit) was their little theater, and so I photographed them on their ‘stage’ set. It’s one of a lot of frames I made, but it’s easy affection and real warmth keeps me engaged. 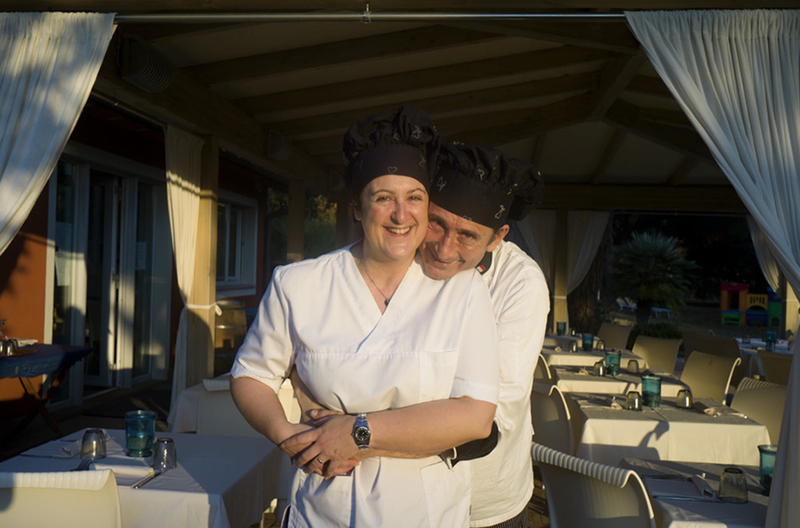 This entry was posted in Couples, Family, Italy, Portrait, Restaurant and tagged portrait, restaurant, Tuscany on July 25, 2015 by joelmeyerowitz2014.